Heat oven to 325°F. Grease and lightly flour 12-cup fluted tube cake pan, or spray with baking spray with flour. In large bowl, beat cake mix, water, oil and egg whites with electric mixer on low speed 30 seconds, then on medium speed 2 minutes, scraping bowl occasionally. Pour about 1 2/3 cups batter into pan. Into small bowl, pour 1 1/3 cups batter; stir in almond extract and food color. Carefully pour pink batter over white batter in pan. Stir chocolate syrup into remaining batter. 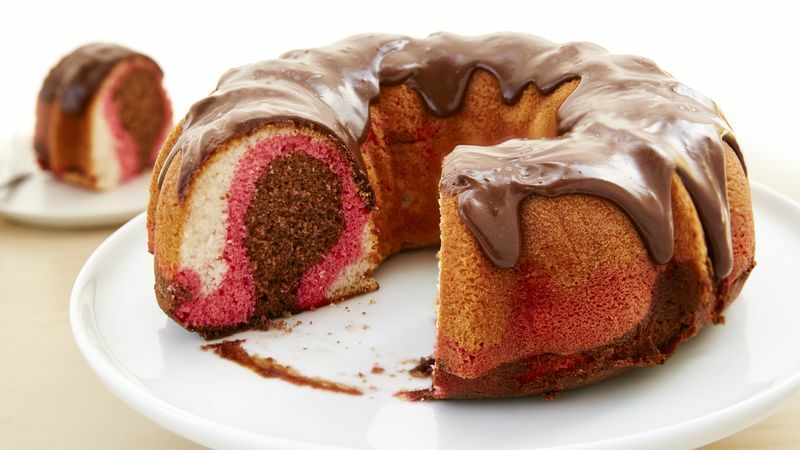 Carefully pour chocolate batter over pink batter. Bake 40 to 45 minutes or until toothpick inserted 1 1/2 inches from side of cake comes out clean. Cool 10 minutes. Turn pan upside down onto cooling rack or heatproof serving plate; remove pan. Cool completely, about 1 hour. In microwavable bowl, microwave frosting uncovered on High about 15 seconds or until frosting can be stirred smooth and is thin enough to drizzle. Spread over top of cake, allowing some to drizzle down side. Store loosely covered. Fluted tube cake pans can be a challenge to grease. To make it easier, place a dab of shortening on the outside of a small plastic sandwich bag. Slip the bag on your hand, and rub shortening on the inside of the pan. Repeat with more shortening until every surface is greased. Serve with Neapolitan ice cream, of course!